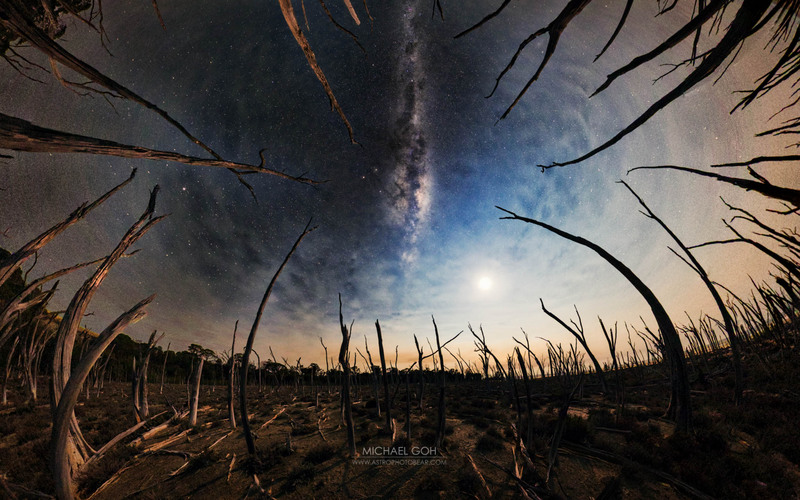 Trip report for recent astrophotography expedition to Lake Dumbleyung in Western Australia. While it’s easy to plan for the milky way positioning in respect to the landscape and other celestial objects, other local conditions and weather conditions remain a challenge. In this particular instance the weather forecast kept changing rapidly – even materially changing several times on the day itself. There was also an aurora alert for around 2-3am in the morning which sounded great (but didn’t occur till after sunrise). As it happened … I scouted the lake when I got to the location. During the scouting, the thick clawing mud surrounding the lake held me fast and when I tried to walk, I fell over into the lake (thank fully not while I was carrying the camera equipment). There had been some nearby controlled fires as well – I could smell smoke through the air. The forecast still air also changed to a strong breeze. Overall, not ideal conditions for what I was after and meant a lake reflection shot was not practical. I improvised and went to the dead trees that surrounded the lake. I knew also that there would be a challenge to the moon luminosity – about 27%. This is much brighter than my preference, but was relying on a sufficient separation from the milkyway core to make it usable. The lake really wasn’t very friendly with me on this trip – it even ate part of my tripod. The image is a 59 image panorama in 3 levels. The left side of the panorama is lit by the moon and the right side is effectively silhouetted by the moon. The fish eye effect is created by the way the panorama is stitched together. Due to the closeness of the foreground interest, I’ve kept the tripod fairly low (around 1m) and used an nodal rail on the ball head. This is important for the stitching to minimise parallax issues. Due to the smoke and fires – I’ve kept the image fairly warm. Mars is next to the milkyway core. The title comes from my daughter – Jessica.